For the 2012 season, Canadian Touring Car Championship drivers have forsaken IndyCar in favour of NASCAR and Formula 1. Series president John Bondar says “scheduling difficulties” prevented the series from competing in a supporting role at the Honda Indy Toronto. But those difficulties meant that the mix of amateur and semi-pro drivers will have competed twice on Circuit-Gilles Villeneuve in Montreal by the end of the season – as a supporting event during the Formula 1 weekend in June and in the upcoming NASCAR Nationwide series weekend August 16 to 18. 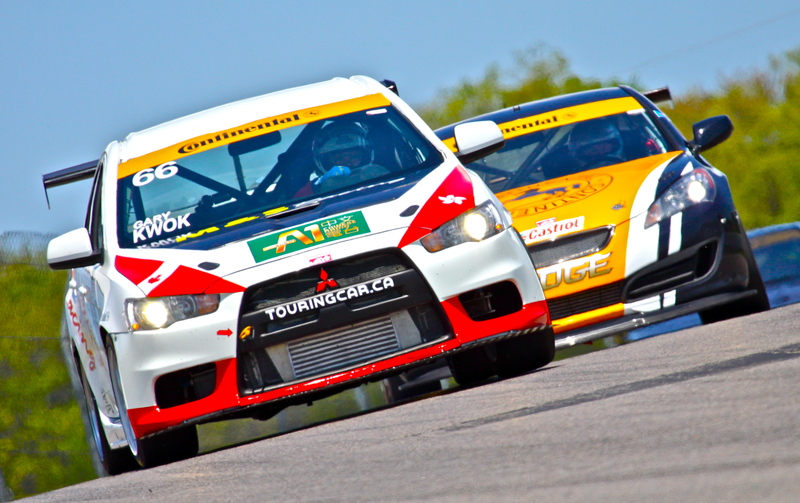 Plus, they’ll head for the first time to the Circuit Mont Tremblant in Quebec on July 6-8. The eight-event season, with two races at each event, began May 18-20 at the Canadian Tire Motorsport Park near Bowmanville, Ont., and ends at Calabogie Motorsport Park, near Ottawa, Sept. 1-2. Going into Mont Tremblant, Sasha Anis of Mississauga, Ont., leads the Super class with 671 points in his G1 Racing Hyundai Genesis Coupe, followed by Philip Fayer in a Pontiac Solstice with 576 points and Anis’s G1 teammate Jonathan Rashleigh with 516 points. Atop the Touring standings sits Michel Sallenbach of Roxton Pond, Que., and his Mini Cooper S JCW with 664 points followed by Jocelyn Fecteau of Mont St-Gregoire, Que., in a Scion tC with 550 points and Paul Gravel of St-Guillaume, Que., Sallenbach’s teammate, with 536 points. Anis credits consistent driving and a bit of luck for putting him at the top of the Super class standings. He was helped by two race wins at the ICAR circuit near Montreal on June 23 and 24 and he notched two second places in the season’s first two races at Bowmanville, then a pair of thirds during the Formula 1 weekend in Montreal. But he’s more concerned about maintaining that consistency than thinking too much about whether or not he’ll be on the top of the standings at the end of the season. Bad luck and mechanical gremlins plagued Anis last season –from being hit and spun out during a race at ICAR, to having a tie rod break and hitting the wall at Bowmanville. Then there was a turbo failure and a differential that fell off his car. “It was some really weird, crazy stuff,” he said. Trust among drivers is key in any racing series, as drivers get to know each other and respect individual driver’s abilities, which allows them to compete and give each other racing room when necessary. But Anis admits maintaining that level of trust can be a challenge in fields of 37 cars, some driven by part-time racers who don’t compete in every race. Then there’s the crop of rookies to deal with. This year, there are 11 new drivers in the series. Some of those new guys (and at least one woman, Valerie Limoges of Shawinigan, Que.) are competing in the new B-spec class, an entry level class for subcompact cars like the Mazda2 and the Honda Fit. While Super class cars are heavily modified with advanced aerodynamics and Touring cars have some limited modifications, the B-spec cars are nearly showroom stock racers. The B-spec class has proven unexpectedly competitive. The 2009 and 2010 Super class champ Nick Wittmer, of Vaudreuil-Dorion, Que. leads the B-spec pack with 694 points, followed by Simon Dion-Viens of St. Joseph de Kamouraska, Que., with 643 points and Greg Pootmans of Toronto with 437 points. All are driving Honda Fits. Bondar admits having a former champion potentially run away with the B-spec class wasn’t the intention of the class when it was created. But, he’s pleased that it can showcase the skills of a driver like Wittmer. « Is racing still relevant?